Helsinki-Cotonou Ensemble fuses West African rhythms to an array of jazz, funk and rock for a high-energy sound that appeals to heart, head and feet. Born in Benin in 2009, the band has won fans with high-energy live shows on three continents. July 2015: A cold, wet afternoon at Pori Jazz Festival. Seeking shelter from the rain, festival-goers stumble into a tent where Helsinki-Cotonou Ensemble is setting musical fire to the stage. With a riotous horn section, blazing guitar solos and African drums, this band is an instant party. Soon the place is packed with dancing people wearing broad grins. Charismatic vocalist-percussionist Noël Saïzonou and guitarist Janne Halonen are at the heart of Helsinki-Cotonou Ensemble. The band’s roots go back to 2009, when Halonen was an artist-in-residence at Villa Karo, the Finnish-African cultural centre in Benin. It’s located in Grand Popo, a coastal village 80 km from the biggest city, Cotonou. Saïzonou moved to Grand Popo around 2000, releasing a couple of traditional solo albums and forming Trio Toffa with visiting Finnish keyboardist Kari Ikonen – a group in which Halonen, too, later played. Halonen’s own musical roots go back to plunking Beatles and Rolling Stones songs on guitar in fifth grade. As a teen, he started playing live at Jyväskylä’s Jazz Bar, where a few years earlier, Ikonen had been a regular before going to Benin. Halonen’s first contact with African music was Peter Gabriel’s 1994 Secret World Live album featuring Youssou N’Dour and Papa Wemba. “I went absolutely crazy over that record and video,” he says. After a year in Montana and another in the army, he moved to Helsinki, where he discovered the records of Nigerian Afrobeat pioneer Fela Kuti and his son Femi Kuti. Halonen credits Beninese jazz guitarist Lionel Loueke with introducing him to the country’s music. Halonen lined up a stay at Villa Karo – but first visited his old bandmate, pianist Joona Toivanen in Gothenburg, just as Loueke was in town playing with Hancock. Halonen contacted the guitarist, who invited him to his hotel and put the Finn in touch with musicians in Benin. Janne Halonen and Noël Saïzonou. Benin’s brass band tradition dates back to its days as a French colony. But the backbone of the nation’s music stretches back millennia. “Benin is rhythm,” says Saïzonou. “Our conservatory here is rhythm, that’s what you get your master’s diploma in! I have a dream of building a conservatory in Grand Popo which will focus on rhythm, all the voodoo rhythms. Because today many younger musicians are going away from that; they don’t know the tradition. Back in Finland, Halonen began composing based on what he’d learned, for the first time writing based on rhythmic cycles or claves. “Since then I’ve tried to write melodies and harmonies that lock into that rhythmic centre, or work against it,” he says. That was followed two years later by Fire, Sweat & Pastis, ranked as Folk Music Album of the Year in Finland and near the top of the European World Music Chart. In 2015, the band toured Benin and Europe and the following year Canada, including the Montreal Jazz Festival, earning different kinds of adulation. In late 2016 the tour-seasoned band released a live album, The Road is Long. It captures energetic, reinvented versions of earlier tracks, showing of their wide range of musical affinities. On the record, “Agamafa” echoes Charles Mingus and Sun Ra, while “Adande”– where Halonen’s searing guitar solo is answered by an extended sax foray by Linda Fredriksson – brings to mind Steely Dan or any number of jam bands. Besides half a dozen Finns, the band includes Tanzanian drummer Menard Mponda, a former Sibelius Academy Global Master based in Tampere. Various horn players join for tours and recording sessions, including Benin’s Ahouandjinou brothers. Their distinctive sound spurs a range of reactions. 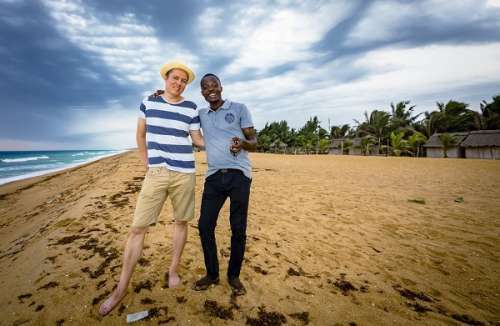 In April 2017, Halonen and Saïzonou sat down in Grand Popo to write songs for the group’s third studio album, to be released in 2018 through a small label, rather than DIY as its predecessors. As always, their new songs will be honed on the road, with spring and summer gigs from German clubs to a big Finnish rock festival.